The 54-year-old Queens relic needs significant structural work, and bids have thus far been deemed unviable by the parks department. The New York State Pavilion, a hulking 54-year-old relic of the World’s Fair, has waited patiently for its return to glory. 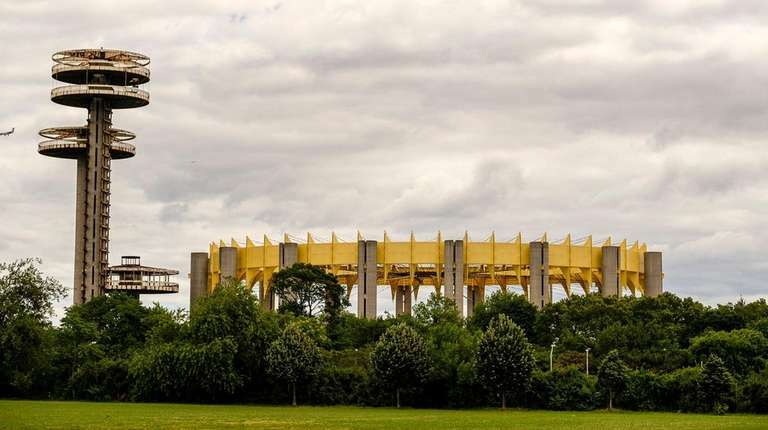 Once hailed as an architectural wonder of the Space Age, the massive, rusted structure in Flushing Meadows-Corona Park now simply marks the nightmarish traffic nexus of the Long Island Expressway, the Grand Central Parkway and the Van Wyck Expressway. Recent years have brought a resurgence of sorts for the structure, titled a “Modern Ruin,” in a 2014 documentary. City officials and preservationists have rallied together and secured $14 million for vital structural repairs and ambient lighting for the pavilion. But finding a firm that is ready — and able — to take on the project has proved to be its own challenge, causing even more delays. Only two construction companies responded to a bid that went out earlier this year. Neither were deemed viable by the Parks Department. The city will again solicit bids later this summer, and are hoping for a better response. Designed by renowned architect Philip Johnson for the 1964-65 World’s Fair, the pavilion is comprised of the 350-foot-by-250-foot Tent of Tomorrow — supported by 16 columns that are 100-feet tall along — with three, tiered observation towers rising 60, 150 and 226 feet. The Tent of Tomorrow, which once boasted the largest cable suspension roof in the world, housed a huge terrazzo map of New York State. Only remnants of the map remain today. After the fair, the pavilion was used sporadically for concerts and as a roller rink but there was little money available for its upkeep. Until the 1980s, New Yorkers could walk inside the pavilion and across the map. Structural and safety concerns, however, eventually forced the city to close it to the public. “It has been neglected, but not forgotten,” said Mitchell Silverstein of the New York State Pavilion Paint Project, a volunteer group that has helped maintain the exterior of the pavilion since 2009 and has fought to get it more attention. Silverstein noted that hundreds of people waited for hours during 50th anniversary celebrations in 2014, just to take a peek inside the mysterious space. The reconstruction project will not transform the pavilion or provide unlimited public access, but Khan and Silverstein said it’s a crucial first step toward future renovations and possible uses. A team of engineers, architects and historic preservation experts crafted the design plan which includes repairing deteriorated concrete and stairs along with replacing electrical infrastructure and suspension cables. Colored lighting will give the commanding structure an almost ethereal glow in the nighttime. Fluctuating steel costs could be an issue, as well as having staging areas to store materials and transportation costs, Richardson said. City Councilman Barry Grodenchik, who chairs the Parks Committee, said the project could be a “game-changer” for the park and said he plans to hold hearings to find out why so many parks projects are delayed. But he acknowledged the issues are likely city regulations that the agency is required to follow. World’s Fair fountains in Queens to get $5M makeoverThe fountains were renovated in 2000, but broke again a few years later. Bid farewell to Flushing Bay’s infamous stench"You can actually smell the trees now."